With the introduction of the 4th generation Shuffle, it seems that Sony has quietly lowered the price on their W-Series. The price in Canada has dropped by $20 to $79.99 CAN with models available in orange, black, pink, white and violet; in the US the price has gone down from $69.99 to $59.95 US and models come only in black and pink. Links after the break. Regrettably in Canada, the Shuffle also comes in a 4GB version and is cheaper when comparing identical capacities. 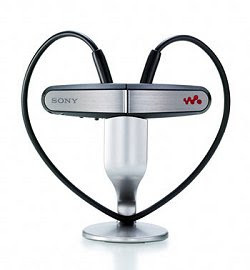 I have yet to see one person jogging with this or even wearing it, but I am sure there are people that have purchased the W. The only advantage the W has over the Shuffle are the headphones, but this will cease once manufacturers start shipping shuffle compatible headphones, Sony included. New A-Series to debut at IFA 2009?